I’ve never been very big on serving up vegetarian dishes in my house. I mean… I like vegetables and all (quite a lot, actually! ), but the idea of serving non-meat kinds of dinners in my house is not met with great enthusiasm by my family. So I save dishes like this for times when dinner is just for me, and then I can munch on it for a few days and keep it all to myself. This recipe comes from the new book by Sara Kate Gillingham and Faith Durand: The Kitchn Cookbook- Recipes, Kitchens and Tips to Inspire Your Cooking. 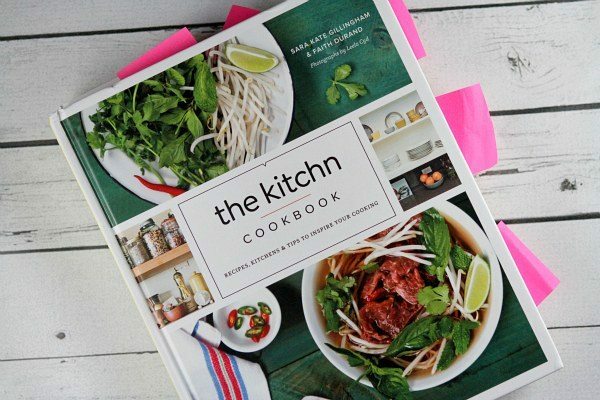 I have always been a fan of their website: TheKitchn.com– great recipes shared, lots of product recommendations and cooking tips. Their cookbook is much of the same. You can see that I have several recipes tagged to make. I had to hold myself back from tagging more because there were a lot of things that looked great! This dish is a one-pot masterpiece. That means you will only have to clean one dish, and that’s a big-fat-bonus, right?? 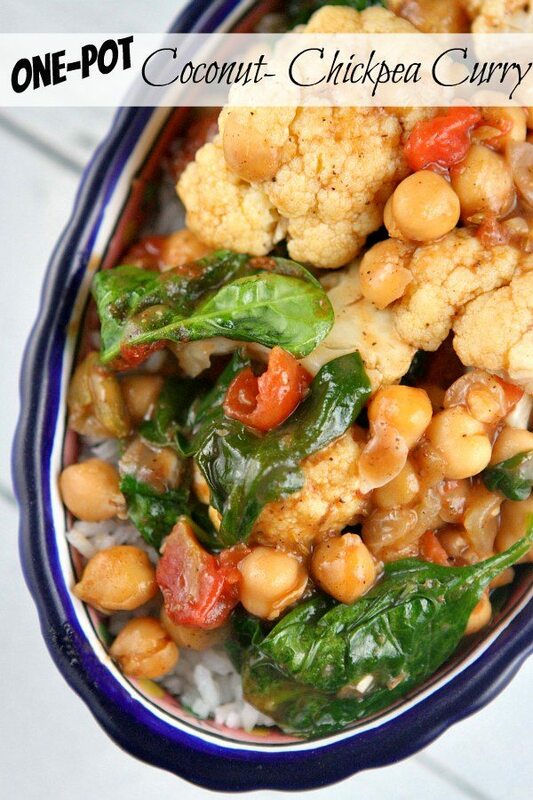 Onion, garlic, ginger, tomato, chickpeas and cauliflower are simmered in a spiced-up (not HOT!) coconut curry sauce. The spinach is swirled in just before serving. The end result is served over some steamed rice (quinoa would be great too). Since my husband was traveling last week, I’m the only one who ate this for dinner in my house. But I ate it for days, and I really enjoyed it a lot. 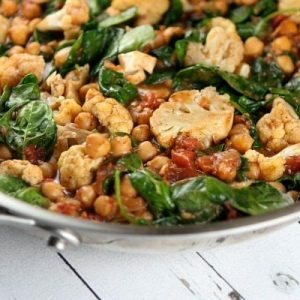 The spicy flavors are enough to keep things interesting, and the chickpeas and cauliflower help to make it a filling and satisfying dish. 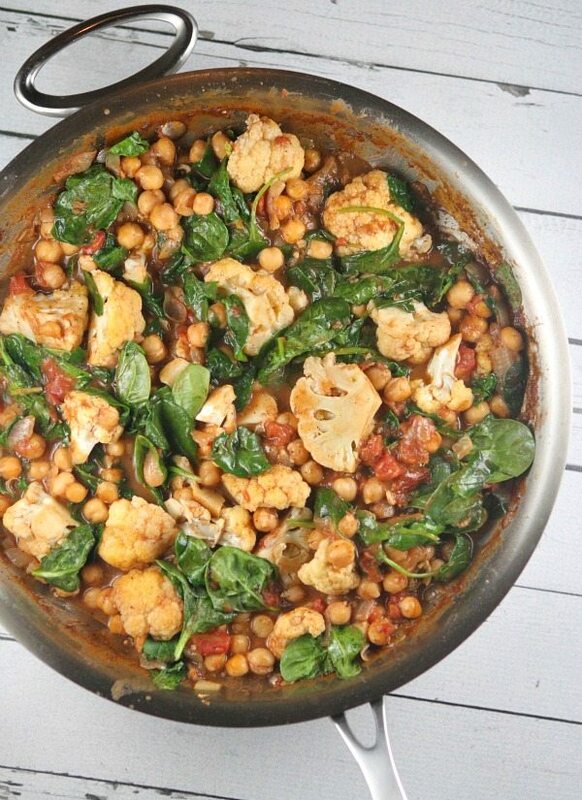 This one is going on my list of vegetarian meals to make again! This is not a spicy curry at all; it's mild enough for young children. If you like things spicy, add 1 to 2 chopped jalapenos with the garlic and ginger. In a small bowl, combine the garam masala, cumin and ground ginger. Use the flat of a chef's knife to crack the cardamom pods and add those to the bowl too. Heat the butter in a heavy skillet or Dutch oven over medium heat. Add the onion and cook for about 10 minutes, browning the onion and letting it develop dark color, although without burning it. Stir in the garlic and ginger and cook for 2 minutes. Add the spices from the cup and stir them into the onion mixture. Add the tomatoes and the chickpeas and saute for about 2 minutes. Take the pan off the heat and stir in the shaken coconut milk. Return the pan to the heat and bring to a gentle boil. 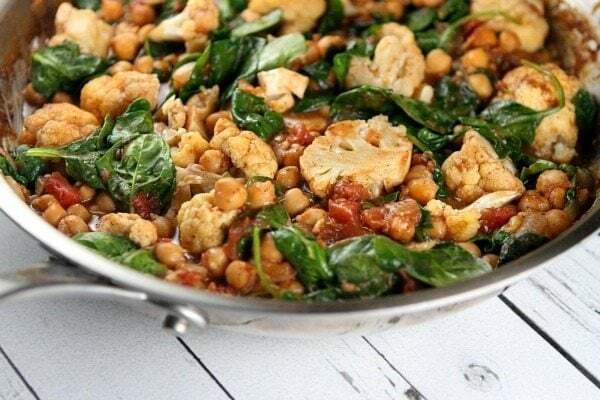 Turn down the heat, stir in the cauliflower and simmer for about 30 minutes, or until the chickpeas are tender and the sauce has reduced slightly. Add the baby spinach in handfuls, stirring in each handful to help it wilt before adding the next. Stir in the lemon juice. Taste and season with salt. Serve immediately over rice, or let cool and refrigerate. The curry will hold up well in the refrigerator in an airtight container for up to 5 days. If you are preparing this recipe as GLUTEN-FREE, just be sure to use brands of tomatoes, chickpeas and coconut milk that are known to be GF. If you don't have fresh spinach, it's okay to sub 1 cup thawed and drained frozen. 3 WEIGHT WATCHERS Freestyle SmartPoints per serving (if you use light coconut milk). Rice or quinoa for serving should be counted as extra points.